The Paul Reed Smith Archon 25 combo amplifier dishes out a wonderfully alluring reproduction of your performance in classic PRS style. 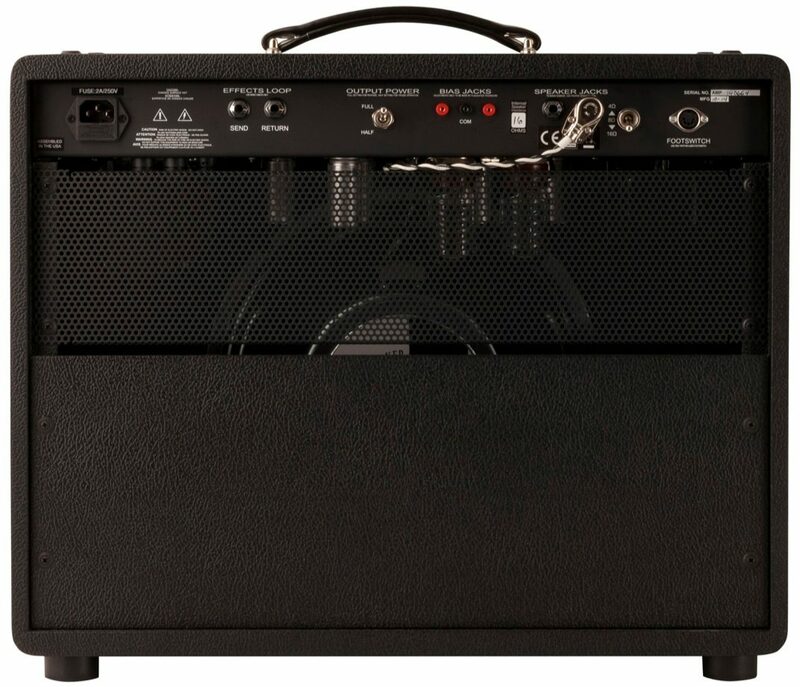 Along with 25-watt and 13-watt switchable power settings, this amp utilizes two 5881 power tubes, six JJ12AX7 preamp tubes, separate three-band EQ controls for the lead and clean channels, bright switches for each channel, master volume controls for each channel, universal depth and presence controls, and two speaker output jacks with 4 ohms, 8 ohms, and 16 ohms settings for virtually any cab you might want to incorporate. All of that tube-infused tone makes its way through a clear and articulate 12" Celestion G12-75T speaker. Your PRS Archon 25 combo provides two channels of all-tube tone for your playing pleasure. The lead channel offers loads of gain for wailing riffs, controlled feedback, and lightning-fast runs and licks. Each channel has its own 3-band EQ control layout, so you can control the brightness, darkness, and midrange punch of each channel without affecting the other. This amp's 5881 power tube and JJ12AX7 preamp tube complement means your output will have that awesome warmth, color, and breakup that solid-state amps simply can't replicate when pushed to the max. This lightweight combo amp comes with two wattage settings. Switchable power means this amp works well in any setting -- from the largest stage to your own bedroom. The 25-watt setting gives you plenty of volume and gain to tear the stage up. Switch on over to the 13-watt setting via the wattage selector switch on the back panel to get a different contour. When you push the gain up on a lower wattage setting, you'll get all that rich cranked-up tube distortion without rattling the windows. Bring the gain and volume down, and hear your axe purr like a kitten. Don't neglect your depth and presence control dials on the right side of the front panel. Depth and presence controls are usually the last line of control in the chain your guitar's signal goes through before hitting the room. After the input gain stages, the presence control determines the amount of high-mid frequencies that are fed back. The depth control will act on the lower-end frequencies -- this control is responsible for the "wuff" sound guitarists like to talk about. This amp is relatively compact and lightweight, so if you want to bring an external cab into the mix, you'll find two speaker output jacks on the back. You have 4 ohms, 8 ohms, and 16 ohms setting to work with, leaving the door open for a wide array of cab choices. - Dimensions: (L x W x D) 21.5 x 10.5 x 17.75"
- Front Panel Controls: Volume/Treble/Middle/Bass/Master for each channel, Bright Switch for each channel, Global Presence & Depth. - Rear Panel Controls: Half Power Switch, Impedance Selector, Bias Jack Terminals with Fixed/Adjustable or Cathode Bias. From the largest stage to the practice room, PRS Paul Reed Smith Archon amps are versatile and commanding tools for musicians who want a flexible, modern amp. The Archon 25 maintains the Archon's two channel platform, providing aggressive high-gain tones and sparkling cleans in a low wattage tube combo that is perfect for the stage, the studio, or at home. 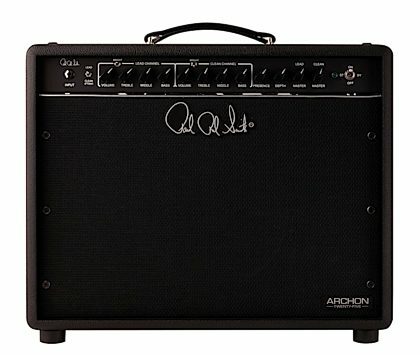 The Archon 25 brings the 'king' of PRS high-gain amplification to the world of small, low wattage tube amps. The Archon's lush distortion and singing clean channel tones are all here in a 25 watt package (switchable to 13 watts via the back panel). 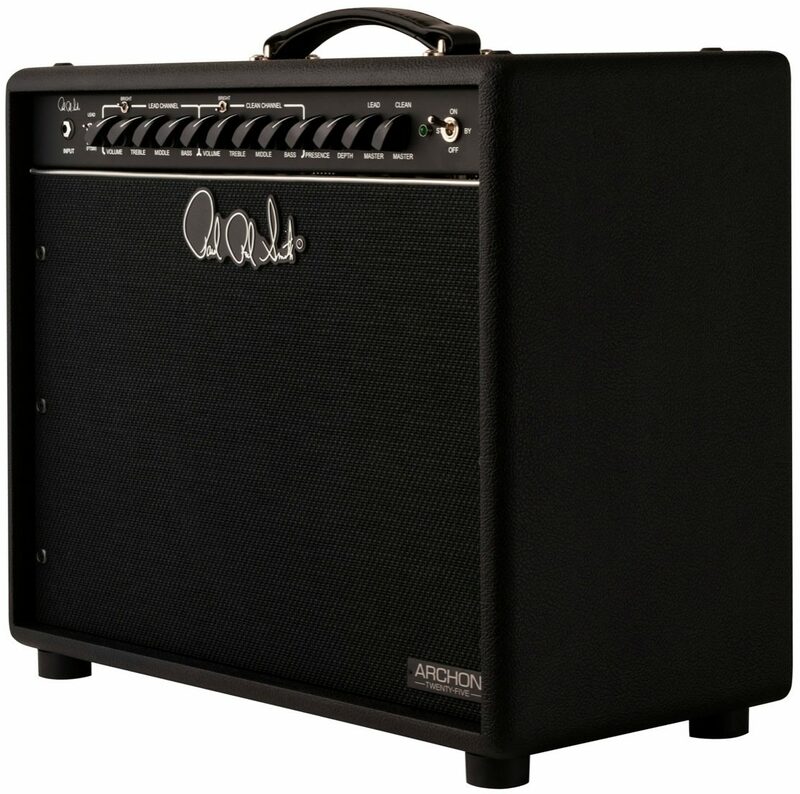 The Archon 25's wattage makes the amp easier to push to optimum performance - tube amps sound best when pushed a little - and it gets there at a lower volume, which is a huge benefit not only at home, but also in the studio and on the stage. Recording with an amp at lower volumes will give you a cleaner signal and a truer tone, and on the stage, the soundman will thank you for not blowing out the other members of the band. 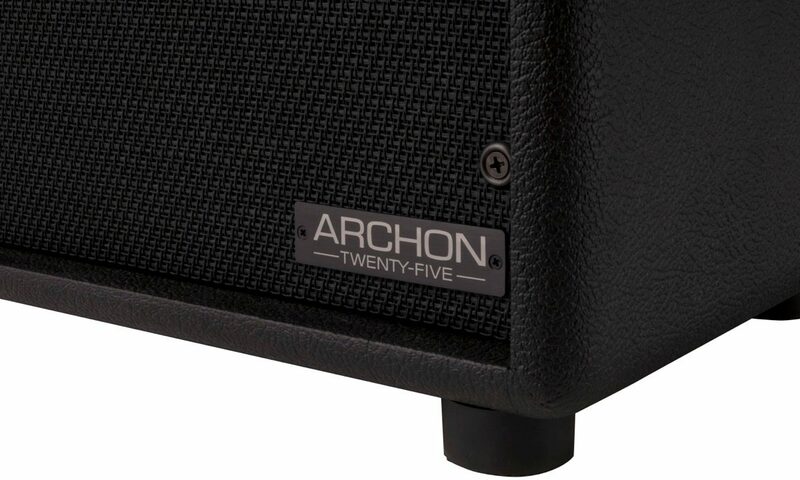 Bottom line, the Archon 25 keeps all the tone and flexibility of the Archon family intact, is a little more forgiving than its 100 and 50 watt big brothers, and won't break your back every time you load in for a gig. The PRS Archon Combo amp is a serious contender in the world of high-gain amplifiers, and for good reason. The saturation that you can achieve is clear and defined, while retaining a lot of the basic characteristics that your pickups provide. In so many words, your tone is preserved even on higher-gain settings, which gives the amp applications from all types of rock, to metal and anything in between. The controls and layout are incredibly simple and user-friendly, but offer enough control over your tone to satisfy even the most finicky of tone-shapers out there. The low end was fat and sounded crushing on palm mutes and power chords, and the leads were not overly bright or harsh. Overall, this amp is superb and certainly worthy of all of the attention it's received. Overall: I received my amp quickly-thanks zZounds, great service as always-and when I played it on the clean channel you could hear distortion underlying the clean signal. I opened up the back and did not see any obvious problems with the tubes. I called PRS Customer service and talked to Matt. We discussed the problem and he didn't think it was a tube either. He told me to send it to them and they would check it out-he sent me Fed Ex label and I shipped it to Maryland. They fixed it within a week (bad tube socket) and shipped it back to. I really wasn't expecting see my amp for about 4-6 weeks but the whole process only took about 12 days (3 days to ship one way) The guys at PRS provided excellent customer service and really took care of me. A grateful thanks to Matt and the whole team at PRS-you guys rock!The amp has a very nice creamy gain to it (can jam anything from blues to hi gain metal stuff) and the clean channel (thanks to PRS) is crystal clear and has a sweet clean, sparkling signal-over all a great amp and will even sound better after a get some hours on it to break in the speaker. Both 25 watt and 13 watt mode a very usable and they both have massive volume for a low watt amp. The EQ is (each channel has bass, mids and treble) responsive and getting the tone you want can be dialed in easily. I really like having a Master volume for both channels (not common for a low wattage amp ) so you can get your sound and crank it where you want it-you also have a Presence and Depth control to adjust you overall tone even further. I have an Eganater Tourmaster 4212 and a 50 watt Fender Machete (which is Fender's version of a metal amp-great amp) and the Archon can hold its own with each-massive gain and volume in a small package. It weighs in at 37 pounds I believe, which means you carry it with one hand-the main reason I bought it but am very impressed with what this little amp can do-I wasn't expecting it the be something you can gig with in a small to medium venue, I had purchased it mainly for practice (light and easy to carry around) but I will not have any reservations about gigging with it. Great product from PRS and excellent service-I highly recommend it. Thanks to zZounds also for offering easy payment plans and providing great service as always. Style of Music: Prefer metal, 80's hair bands, alternative rock and blues but will play anything that is called for.